RESEARCH involving the use of bee venom to treat breast cancer has landed a Willetton 23-year-old in the running for the WA Young Achiever Awards. Ciara Duffy is among four nominees for the awards living within the City of Canning. Chronic wound infections are a major burden to both society and the health care industry. Bacterial biofilms are the major cause of chronic wound infections and are notoriously recalcitrant to treatments with antibiotics, making them difficult to eradicate. Thus, new approaches are required to combat biofilms in chronic wounds. One possible approach is to use drug combination therapies. Manuka honey has potent broad-spectrum antibacterial activity and has previously shown synergistic activity in combination with antibiotics against common wound pathogens, including Staphylococcus aureus. In addition, manuka honey exhibits anti-biofilm activity, thereby warranting the investigation of its potential as a combination therapy with antibiotics for the topical treatment of biofilm-related infections. Here we report the first use of MacSynergy II to investigate the response of established S. aureus (strain NCTC 8325) biofilms to treatment by combinations of Medihoney (medical grade manuka honey) and conventional antibiotics that are used for preventing or treating infections: rifampicin, oxacillin, fusidic acid, clindamycin, and gentamicin. Using checkerboard microdilution assays, viability assays and MacSynergy II analysis we show that the Medihoney-rifampicin combination was more effective than combinations using the other antibiotics against established staphylococcal biofilms. Medihoney and rifampicin were strongly synergistic in their ability to reduce both biofilm biomass and the viability of embedded S. aureus cells at a level that is likely to be significant in vivo. Other combinations of Medihoney and antibiotic produced an interesting array of effects: Medihoney-fusidic acid treatment showed minor synergistic activity, and Medihoney-clindamycin, -gentamicin, and -oxacillin combinations showed overall antagonistic effects when the honey was used at sub-inhibitory concentration, due to enhanced biofilm formation at these concentrations which could not be counteracted by the antibiotics. However, these combinations were not antagonistic when honey was used at the inhibitory concentration. Confocal scanning laser microscopy confirmed that different honey-antibiotic combination treatments could eradicate biofilms. Our results suggest that honey has potential as an adjunct treatment with rifampicin for chronic wounds infected with staphylococcal biofilms. We also show that MacSynergy II allows a comprehensive examination of the synergistic effects of honey-antibiotic combinations, and can help to identify doses for clinical use. 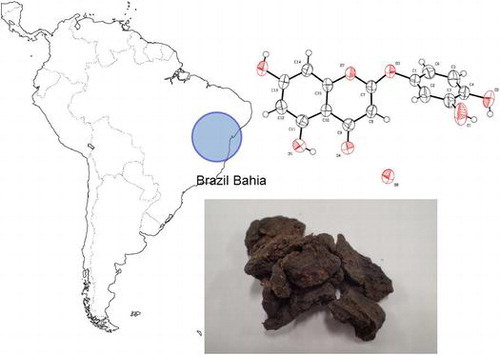 A novel 2-phenoxychromone (1) and five known flavones (2-6) were isolated from northeastern Brazilian propolis in the state of Bahia. The chemical structures of these six compounds were determined by spectroscopic investigations and single-crystal X-ray analysis. The isolated compounds showed growth-inhibitory activities, in varying degrees, against human tumor cell lines. This is the first report on the discovery of a novel 2-phenoxychromone from propolis. Single and joint antibacterial activity of aqueous garlic extract and Manuka honey on extended-spectrum beta-lactamase-producing Escherichia coli. Multidrug resistance and recent technological advances have renewed interest in natural product drug discovery from ancient remedies such as Allium sativum (garlic) and honey. This study assessed antibacterial activity of aqueous garlic extract (AGE) and Manuka honey on extended-spectrum beta-lactamase (ESBL)-producing Escherichia coli. Thirty clinical isolates of E. coli were collected and screened for ESBL production by double-disc synergy test. Single and joint antibacterial activity of AGE and Manuka honey against ESBL-producing E. coli were determined by agar well dilution and checkerboard methods, respectively. Minimum inhibitory concentration (MIC) and minimum bactericidal concentration (MBC) of AGE ranged from 125-250 mg/mL and 250-500 mg/mL, respectively. MIC and MBC of Manuka honey ranged from 12.5-25% v/v and 25-50% v/v, respectively. The combination of AGE and Manuka honey exhibited different effects on selected ESBL-producing E. coli; synergism (1/4H+1/16G), additive (1/8H+1/2G, 1/2H+1/16G), indifference (1/16H+MICG, MICH+1/16G, 2MICH+1/32G) and antagonism (4MICH+1/32G). Manuka honey exhibited greater antibacterial activity against ESBL-producing E. coli than AGE. Antibacterial activity, and the interaction of AGE and Manuka honey against ESBL-producing E. coli are dependent on their concentration. Studies assessing antibacterial activity of potent phytochemicals in AGE and honey would provide insights to mechanisms of interaction for development of new drug leads. J Contemp Dent Pract. 2018 Jan 1;19(1):47-51. In medicine, honey is known for its various biological or pharmacological effects, from wound dressing to anticancero-genic and from anti-inflammatory to antibacterial activities. The aim of the current study was to evaluate the effect of honey on healing of mandibular bone defects in a rat model. This animal study was performed on 24 wild-type Wistar rats. Following shaving, disinfection, and extraoral incision, a 2 × 2 mm defect was created at mandibular angle. In the experimental group, the defect was filled with sterile honey, while it was left unfilled in the control group. The rats were sacrificed after 2 and 4 weeks and defects were assessed histologically. The results were compared using Mann-Whitney U-test (α = 0.05). After 2 weeks, five samples of the experimental group were in mineralization phase, while all samples of the control group were in the vascularization phase (p = 0.015). After 4 weeks, the defects were filled in four samples of the experimental group, while all samples of the control group were in the mineralization stage (p = 0.002). Histomorphometric assessment revealed that the mean new bone formation in the experimental group was significantly more than the control group, both after 2 and 4 weeks (p = 0.041). The results showed that honey could accentuate bone healing of mandibular small defects in rats. Honey might have potential in repair of human alveolar bone defects. The mysteries of the X factor behind Manuka honey are being uncovered by University of Waikato researchers. A team from the School of Science has just completed a groundbreaking study of Manuka nectar physiology, looking at the how the genetics of the plant, age of the flower, and the environment influence nectar production. Lead researcher Associate Professor Mike Clearwater says at the moment predicting the amount and quality of Manuka honey produced from an area can be a bit hit and miss, so they are trying to create a better model. Manuka honey is often branded a superfood and is easy to incorporate into meals and snacks. Manuka honey is well known for being natures richest nutrient source, with its unique range of benefits not found in other honeys. Manuka honey comes from the Manuka bush (Leptospermum scoparium) which is native to New Zealand. Manuka Honey can provide soothing relief of cold symptoms at every stage. Its antibacterial properties protect against the development of symptoms, as well as calming the inflammation during illness1. For example, Manuka can prevent the growth of bacteria such as the Strep bacteria that causes a sore throat2. Manuka honey can also provide further relief of symptoms such as a cough3. Coupled with mullein and marshmallow to relieve dry and chesty coughs, the honey is particularly powerful in alleviating symptoms. A better sleep is essential in recovery. Manuka honey that contains magnesium citrate, is the most absorbable form of magnesium and aids a restful sleep. Combined with Vitamin C and D, it can support deep sleep too. Our skin can draw many benefits from Manuka Honey. It is a natural humectant, meaning that it seals in the skin’s own moisture5. It’s a perfect ingredient to use in facemasks for peeling or cracked skin as it increases cell regeneration and repairs damaged skin cells5. Acne prone areas could be cured by Manuka Honey’s antibacterial and anti-inflammatory properties; the amino acids draw out bacteria and impurities, polishing dead skin skills away4. Manuka honey is often branded a superfood and is easy to incorporate into meals and snacks. Whether you add a spoonful to breakfast smoothies, drizzle over muesli, porridge or salads or use in cooking foods such as gammon. Honey clasps several medicinal and health effects as a natural food supplement. It has been established as a potential therapeutic antioxidant agent for various biodiverse ailments. Data report that it exhibits strong wound healing, antibacterial, anti-inflammatory, antifungal, antiviral, and antidiabetic effects. It also retains immunomodulatory, estrogenic regulatory, antimutagenic, anticancer, and numerous other vigor effects. Data also show that honey, as a conventional therapy, might be a novel antioxidant to abate many of the diseases directly or indirectly associated with oxidative stress. In this review, these wholesome effects have been thoroughly reviewed to underscore the mode of action of honey exploring various possible mechanisms. Evidence-based research intends that honey acts through a modulatory road of multiple signaling pathways and molecular targets. This road contemplates through various pathways such as induction of caspases in apoptosis; stimulation of TNF-α, IL-1β, IFN-γ, IFNGR1, and p53; inhibition of cell proliferation and cell cycle arrest; inhibition of lipoprotein oxidation, IL-1, IL-10, COX-2, and LOXs; and modulation of other diverse targets. The review highlights the research done as well as the apertures to be investigated. The literature suggests that honey administered alone or as adjuvant therapy might be a potential natural antioxidant medicinal agent warranting further experimental and clinical research. Background: The development of bacterial resistance to antibiotics has made it more difficult and expensive to treat infections. Honey is getting worldwide attention as a topical therapeutic agent for wound infections and potential future candidate for systemic infections. Objectives: The purpose of this review was to summarise different antibacterial bio-active compounds in honey, their synergistic interaction and their clinical implications in topical and systemic infections. In addition, contemporary testing methods for evaluating peroxide and non-peroxide antibacterial activity of honey were also critically appraised. Design: MEDLINE, EMBASE, Cochrane Library, Pub Med, reference lists and databases were used to review the literature. Results: Honey contains several unique antibacterial components. These components are believed to act on diverse bacterial targets, are broad spectrum, operate synergistically, prevent biofilm formation, and decrease production of virulence factors. Moreover, honey has the ability to block bacterial communication (quorum sensing), and therefore, it is unlikely that bacteria develop resistance against honey. Bacterial resistance against honey has not been documented so far. Unlike conventional antibiotics, honey only targets pathogenic bacteria without disturbing the growth of normal gastrointestinal flora when taken orally. It also contains prebiotics, probiotics, and zinc and enhances the growth of beneficial gut flora. The presence of such plethora of antibacterial properties in one product makes it a promising candidate not only in wound infections but also in systemic and particularly for gastrointestinal infections. Agar diffusion assay, being used for evaluating antibacterial activity of honey, is not the most appropriate and sensitive assay as it only detects non-peroxide activity when present at a higher level. Therefore, there is a need to develop more sensitive techniques that may be capable of detecting and evaluating different important components in honey as well as their synergistic interaction. Conclusions: Keeping in view the current guidelines for treatment of diarrhea, honey is considered one of the potential candidates for treatment of diarrhea because it contains a natural combination of probiotics, prebiotics, and zinc. Therefore, it would be worthwhile if such a combination is tested in RCTs for treatment of diarrhea. Due to various pharmacological properties, including antioxidative, anti-inflammatory and antibiotic properties, royal jelly (RJ) has been widely consumed in daily diets in numerous countries. In the present study, the effect of RJ on 4T1-bearing mice was investigated. The study was performed by feeding 4T1-bearing mice with RJ using either the prophylactic-therapeutic (PTRJ) or therapeutic (TRJ) method. 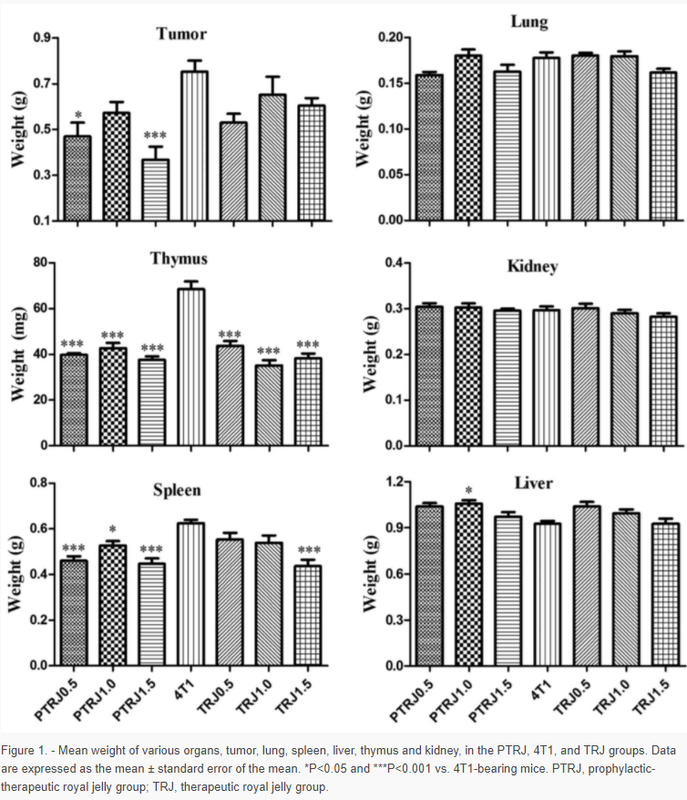 The experimental results for the PTRJ group demonstrated that the weight of tumor was significantly reduced (RJ 0.5 and 1.5 g/kg); and in the serum, the levels of interleukin (IL)-2 (RJ 0.5 and 1.5 g/kg), interferon (IFN)-α, superoxide dismutase (SOD) and total antioxidant capacity (T-AOC) were significantly elevated, but the concentrations of IL-4 (RJ 0.5 and 1.5 g/kg) and IL-10 (RJ 1.0 g/kg) were significantly decreased. In addition, the activities of T-AOC and glutathione reductase (GR) were significantly improved in the liver, whereas in the kidney, the activities of T-AOC and GR were significantly increased only under the dose of 0.5 g/kg. For the TRJ group, the antitumor effect of RJ was not significant; the change in IL-2, IFN-α, SOD and T-AOC levels in the serum, and the change in T-AOC and GR in liver were similar to those observed in the PTRJ groups. RJ treatment was demonstrated to reduce the development of breast tumor in mice, and simultaneously improve the antioxidant capacity of the serum, liver and kidney, particularly using the prophylactic-therapeutic method. These results corroborated the efficacy of RJ supplementation in diets. The results of the present study suggest that the antioxidant and immunomodulatory activities of RJ serve an important role on antitumor growth. Pak J Pharm Sci. 2018 Jan;31(1):129-135. Biofilm is a complex community of single or different types of microorganisms (bacteria, viruses, fungi, protozoa) attached to a surface and stick to each other through production of extracellular matrix. Salmonella typhi forms biofilm on cholesterol gallstones resulting in carrier state. Once formed, biofilm is difficult to treat. To date cholecystectomy is the only cure for this condition. Manuka honey is known to have tremendous antibiofilm activity against various organisms. S. typhi biofilm was grown in vitro on clinical samples of human cholesterol gallstones by Gallstone tube assay method for 12 days. Biofilm mass was quantified on day 1, 5, 7, 9 and 12 by crystal violet assay and was also examined by scanning electron microscope. Three concentrations w/v of Manuka honey (40%, 60% and 80%) were used, each one at 24, 48 and 72 hours. The most effective concentration (80% w/v) was repeated on two sets of gallstones. Biofilm mass was re quantified by crystal violet assay and was examined by scanning electron microscope. S. typhi formed uniform biofilm on cholesterol gallstone surface. The optical density measurements exhibited a rising pattern with time thereby indicating an increase in biofilm mass. It was 0.2 on day 1 and 0.9 on day 12. With 80% w/v Manuka honey, biofilm mass decreased most effectively with 0.5 OD after 72 hours. Biofilm formation by S, typhi on gallstones is surface specific and bile dependant. Either increasing the duration (beyond 72 hours) of the effective concentration (80% w/v) of honey or increasing the concentration (above 80%) of honey for a specific duration (72 hour) may cause complete disruption of the S. typhi biofilm on gallstone. S. typhi forms biofilm on cholesterol gallstones surface in vitro and it can be visualized by scanning electron microscopy. Biofilm mass can be quantified using crystal violet assay. Among various concentrations 80% Manuka honey for 72 hours is most effective in disrupting S. typhi biofilm on gallstones in vitro as evident from crystal violet assay. To investigate whether Brazilian green propolis improves the immune response against recurrent form isolate recurrent vulvovaginal candidiasis (RVVC) caused by Candida albicans by increasing neutrophil oxidative burst. We evaluated oxidant species production, oxygen consumption, microbicidal activity and myeloperoxidase activity in neutrophils previously treated with propolis and activated with different isolates of C. albicans (RVVC), vulvovaginal candidiasis, asymptomatic isolates and the reference strain. Propolis significantly increased oxidant species production, oxygen consumption, microbicidal activity and myeloperoxidase activity of neutrophils against different isolates of C. albicans including RVVC isolate that are considered resistant to the microbicidal activity of neutrophils. 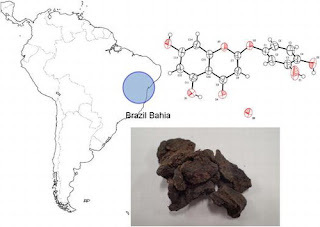 Brazilian green propolis may increase neutrophil burst oxidative response to RVVC leading to an efficient removal of C. albicans. Apis cerana honey (honey of Apis cerana Fabricius), widely distributed in the mountain areas of East Asia, has not been studied fully. The hepatoprotective activity of A. cerana honey was evaluated against bromobenzene-induced liver damage in mice. In high dose, A. cerana honey can significantly alleviate liver injury, as is indicated by the depressed levels of serum alanine aminotransferase (ALT) (59.13%) and aspartate aminotransferase (AST) (79.71%), the inhibited malondialdehyde (MDA) content (63.30%), the elevated activities of superoxide dismutase (SOD) (73.12%) and glutathione-Px (57.24%), and the decreased expression of Transforming growth factor β1 (51.83%) induced by bromobenzene (P < 0.05). The quantitative analysis of twelve major constituents (1 to 12) of A. cerana honey was executed by high performance liquid chromatography-diode array detector. The results indicate that treatment with A. cerana honey can prevent bromobenzene-induced hepatic damage in mice. Polyphenols might be the bioactive substances attributed to its antioxidant properties and intervention of oxidative stress. This study evaluated the physicochemical, nutritional, antioxidant, and phenolic properties of ten honey samples from the Sundarbans mangrove forest, Bangladesh. The average pH, electrical conductivity, total dissolved solid, ash, moisture, hydroxymethyl furfural, titrable acidity, and absorbance were 4.3, 0.38 mS/cm, 187.5 ppm, 0.14%, 17.88%, 4.4 mg/kg, 37.7 meq/kg, and 483 mAU, respectively. In the honeys, the average contents of Ca, Cu, Fe, K, Mg, Mn, and Na were 95.5, 0.19, 6.4, 302, 39.9, 3.4, and 597 ppm, respectively, whereas Cd, Cr, Pb, and Ni were not found. The average contents of total sugar, protein, lipid, vitamin C, polyphenols, flavonoids, and anthocyanins in the honeys were 69.3%, 0.8%, 0.29%, 107.3 mg/kg, 757.2 mg gallic acid equivalent/kg, 43.1 mg chatechin equivalent/kg, and 5.4 mg/kg, respectively. The honeys had strong 1,1-diphenyl-2-picrylhydrazyl free radical scavenging activity, reducing power and total antioxidant capacity. 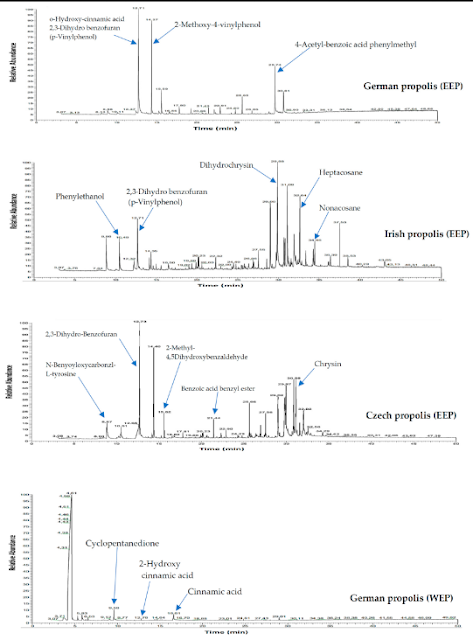 High-performance liquid chromatography analysis of the honey fractions revealed the quantification of six polyphenols namely, (+)-catechin, (-)-epicatechin, p-caumeric acid, syringic acid, trans-cinnamic acid, and vanillic acid at 194.98, 330.34, 74.64, 218.97, 49.55, and 118.84 mg/kg, respectively. Therefore, the honeys in the A. A Sweet Solution: The Use of Medical-grade Honey on Oral Mucositis in the Pediatric Oncology Patient. Pediatric patients develop mucositis when receiving treatments such as chemotherapy and radiation; the most common and sensitive is oral mucositis. Mouth rinses containing antimicrobial, antihistamine, and analgesic medications are the mainstay for pediatric patients; however, patients often refuse these rinses due to the taste or texture. Also, patients under 1 year of age are unable to use these products. Herein, the improvement of oral mucositis with standard oral care and additional use of active Leptospermum honey in pediatric oncology patients after chemotherapy is demonstrated. Patients received oral care every 4 hours followed by application of the honey paste 3 times daily. The honey paste was applied with a sponge swab to coat the mouth. Patients either swished and spit or had excess honey suctioned out. At completion of this evaluation, the honey treatment was used in 10 pediatric oncology patients between the ages of 9 months and 17 years. The Leptospermum honey paste was easy to apply and was well received by all patients. Healing was observed within 3 days, and patients in all cases reported decreases in pain. Decreased wounds and bleeding were evident in all cases within 5 days. Leptospermum honey paste proved to be effective in all participating patients. Pancreatic cancer is one of the most aggressive and lethal cancer, with poor prognosis and high resistant to current chemotherapeutic agents. Therefore, new therapeutic strategies and targets are underscored. Propolis has been reported to exhibit a broad spectrum of biological activities including anticancer activity. This study was carried out to assess the possible efficacy of Algerian propolis on the antitumor effect of doxorubicin on human pancreatic cancer cell line (PANC-1). Modifications in cell viability, apoptosis and cell cycle progression, Pgp activity and intracellular accumulation of DOX were monitored to study the synergistic effect of Algerian propolis on the antitumor effects of DOX in PANC-1 cell line. Both propolis and its combination with doxorubicin inhibited cell growth in a dose-dependent manner by inducing cell cycle arrest and apoptosis. In the presence of 100 µg/ml of propolis, the IC50 of DOX against PANC-1 cells decreased by 10.9-fold. Propolis combined with DOX increased after 48h, the number of cells in the G0G1 phase with dramatical increase in sub-G1 phase to reach 47% of total cells, corresponding to an increase of senescence or apoptotic state of the cells. Dead cell assay with annexinV/PI staining demonstrated that propolis and propolis-DOX treatment resulted in a remarkable induction of apoptosis as detected by flow cytometry. It was interesting to note that propolis at its 5IC50 was found as the most potent inducer of apoptosis. Our finding revealed that induced apoptosis in our conditions was caspase-3 and caspase-9 dependent. Flow cytometry showed that propolis increased the accumulation of doxorubicin within PANC-1 cells. Moreover, fluorescent intensity detection revealed that propolis remarkably increased the retention of rhodamine-123, 7-fold compared to 3-fold of verapamil, the most effective P-gp inhibitor. 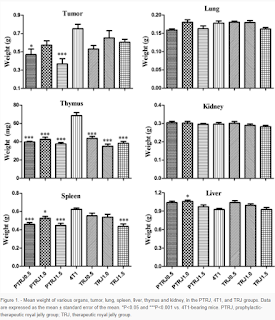 In conclusion, propolis sensitize pancreatic cancer cells to DOX via enhancing the intracellular retention of DOX due to blocking the efflux activity of P-gp pump, inducing cell cycle arrest and increasing apoptosis, finding that improuve the synergism of antitumor effect of Algerian propolis and DOX in pancreatic cancer cell line. Therefore, Algerian propolis may be an effective agent in a combined treatment with doxorubicin for increased therapeutic efficacy against pancreatic cancer. In light of the scarcity of novel therapeutic agents that are effective, the pharmaceutical industry has found a newer source of therapeutic compounds in natural products and herbal medicine to address the current health problems in humans and animals. What is particularly promising about these agents is that they produce fewer side effects and are more cost effective than synthetic compounds. This means greater availability of these treatments particularly for less developed countries who can’t afford expensive treatments. The reduced side effects also mean greater patient tolerance and increased compliance thereby yielding maximal therapeutic effect without negatively impacting on quality of life. Among the natural products more frequently employed nowadays is propolis, a resin that is routinely collected by bees (Apis mellifera). Propolis contains flavonoids, caffeic acid esters and diterpenic acids, which provide the bactericidal, antiviral and antifungal properties to this product. The use of propolis to address a variety of conditions in small animal species is beginning to play an important role in the currently available treatments. Its use appears to be an effective treatment with no side effects at low cost. This paper reviews the different applications of this compound to treat diseases in dogs. The novel biomaterials Copazan Herbal Gel with Bee propolis have been designed to be used in veterinary medicine for the wound healing application. In vitro investigations highlight the suitability of this material for a variety of applications in the veterinary medicine in the future. In this study, we aimed to investigate the neuroprotective effects of caffeic acid phenethyl ester (CAPE), an active component of propolis purified from honeybee hives, on photothrombotic cortical ischemic injury in mice. Permanent focal ischemia was achieved in the medial frontal and somatosensory cortices of anesthetized male C57BL/6 mice by irradiation of the skull with cold light laser in combination with systemic administration of rose bengal. The animals were treated with CAPE (0.5-5 mg/kg, i.p.) twice 1 and 6 h after ischemic insult. CAPE significantly reduced the infarct size as well as the expression of tumor necrosis factor-α, hypoxiainducible factor-1α, monocyte chemoattractant protein-1, interleukin-1α, and indoleamine 2,3-dioxygenase in the cerebral cortex ipsilateral to the photothrombosis. Moreover, it induced an increase in heme oxygenase-1 immunoreactivity and interleukin-10 expression. cThese results suggest that CAPE exerts a remarkable neuroprotective effect on ischemic brain injury via its anti-inflammatory properties, thereby providing a benefit to the therapy of cerebral infarction. The Indian honey bee-Apis cerana indica, which harbors an abundant and diverse range of lactic acid bacteria (LAB) in their gut with beneficial effects was used as the source for the isolation of LAB. In the present study, two LAB isolates from honey bee gut were selected primarily based on their phenotypic and selective biochemical characterization, further PCR and identified using 16S rRNA sequencing as Lactobacillus plantarum and were registered in National Centre for Biotechnology Information (NCBI) under accession number KX519413 and KX519414. The probiotic potency of test strains indicated their survivability at acidic pH, bile salts and viability in simulated gastric juice enabling them to withstand gastrointestinal tract conditions. Evaluation of cell surface properties suggested that they possess an important defense mechanism against the pathogen since they are hydrophobic, auto-aggregative and have co-aggregative ability. Further, efficient exopolysaccharide production by them indicate not only their ability to enrich biofilm formation and auto-aggregation, but also enhance bacterial adhesion and colonization on the host intestinal tract. The present study concluded that L. plantarum from the gut of Apis cerana indica possess probiotic potency, and potential candidates for use as food besides application in nutraceutical and pharmaceutical industries. Despite a centuries-old history of studies of bee venom as a therapeutic agent, this field of research remains quite relevant today, when the use of synthetic drugs is not always effective and has a great number of side effects. In addition to analgesic properties of bee venom that are well known, a number of other useful properties have been established experimentally such as the ability to reduce blood pressure, antiarrhythmic action, radioprotective and antihypoxic effects, as well as antitumor activity. Bee venom's high polyfunctionality is based on a unique combination of its components, including some proteins with enzymatic properties, highly active peptides (melittin, apamin, the mast-cell-degranulating (MCD) peptide, adolapin, tertiapin, secapin, minimin, cardiopep), and biogenic amines. Bee venom peptides have an anti-inflammatory effect, both through direct action and indirectly through the modulation of all other regulatory systems. Thus, the pharmacological activity of small doses of melittin is mediated by the activation of a cascade associated with the synthesis of prostaglandins, which are powerful biological regulators. In addition, melittin has some protective properties, which underlies the radioprotective effects of bee venom. Melittin is also credited with antitumor activity. Its anti-inflammatory activity is associated with the action of the MCD-peptide, while adolapin, a component of bee venom, has an analgesic effect. As they enter the body, bee venom components cause changes in the neurohumoral regulation of body functions not only through the activation of endogenous neuropeptides, but, possibly, as their direct sources. Researchers of the UNN Institute of Biology and Biomedicine (IBBM) have established as a result of laboratory tests that bee venom and bee products inhibit the growth of malignant tumors, enhance biological activity of the body, and can also be used to treat diabetes mellitus. however, is a synonym of the legitimate name Dalbergia ecastaphyllum. These results suggest that CAPE exerts a remarkable neuroprotective effect on ischemic brain injury via its anti-inflammatory properties, thereby providing a benefit to the therapy of cerebral infarction. The antioxidant and antimicrobial components of honey vary based on sourced of nectar. Medicinal plants with the therapeutic value have potential to produce honey with greater bioactivity. The aim of the present study was to characterize the physico-chemical and antioxidant capacities of Agastache honey produced from Agastache rugosa and compare them with other popular commercial honeys sold in Australia. The total phenolics, total flavonoids, moisture content, colour, pH, protein content and antioxidant capacity were evaluated for Agastache, Manuka, Jelly bush, Tea tree, Super manuka and Jarrah honeys. The results reveal that the moisture content ranged from 17-21%, pH ranged from 3.8-4.3 and estimated protein content ranged from 900-2200 µg/g. The DPPH•, ABTS•+, ORAC and FRAP methods were used to measure the antioxidant capacity of the honey samples. The DPPH• % inhibition, ABTS•+, ORAC and FRAP values for Agastache honey were 9.85 (±1.98 µmol TE/g), 26.88 (±0.32 µmol TE/g), 19.78 (±1.1 µmol TE/g) and 3.61 (±0.02 µmol TE/g) whereas the highest antioxidant capacity values obtained were 18.69 (±0.9 µmol TE/g), 30.72 (±0.27 µmol TE/g), 26.95 (±0.9 µmol TE/g) and 3.68 (±0.04 µmol TE/g), respectively. There was a positive correlation between colour, total phenolic content and DPPH• scavenging activity for most of the honeys except Tea tree honey. However, there was no clear correlation with ABTS•+, ORAC and FRAP values. The measured antioxidant capacity of samples varied with the assays used. The DPPH• assay clearly indicated that the phenolic compounds contribute to the scavenging activity of the honeys. Nevertheless, all assays confirm that Agastache honey has significant antioxidant capacity. Therefore, Agastache honey can be important to human nutrition and health. Royal jelly is a functional food with several health promoting properties. 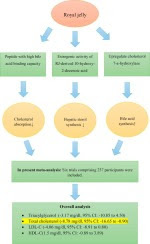 The aim of present meta-analysis was to examine the role of royal jelly in blood lipid profiles. We systemically searched PUBMED, the Cochrane Library, Scopus, Web of Science and Google Scholar to identify eligible studies up to July 2017. Clinical trials which investigated the efficacy of royal jelly on adult blood lipid parameters were included. A random effects model was used for quantitative data synthesis. The pooled analysis of six trials suggested that royal jelly reduces total cholesterol blood levels. No significant change was observed in triglycerides, low-density lipoprotein cholesterol and high-density lipoprotein cholesterol blood concentrations. Subgroup analysis revealed a greater impact of RJ on the decrease of Total cholesterol and the increase of high-density lipoprotein cholesterol levels in studies with a long-term follow-up ( ≥ 90). This meta-analysis suggested that Royal jelly consumption might effective on improvement of lipid parameters. 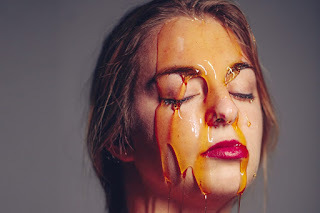 Slathering honey on my face was not what I expected. The purpose of this article is to reveal the role of the lactic acid bacteria (LAB) in the beebread transformation/preservation, biochemical properties of 25 honeybee endogenous LAB strains, particularly: antifungal, proteolytic, and amylolytic activities putatively expressed in the beebread environment have been studied. Seventeen fungal strains isolated from beebread samples were identified and checked for their ability to grow on simulated beebread substrate (SBS) and then used to study mycotic propagation in the presence of LAB. Fungal strains identified as Aspergillus niger (Po1), Candida sp. (BB01), and Z. rouxii (BB02) were able to grow on SBS. Their growth was partly inhibited when co-cultured with the endogenous honeybee LAB strains studied. No proteolytic or amylolytic activities of the studied LAB were detected using pollen, casein starch based media as substrates. These findings suggest that some honeybee LAB symbionts are involved in maintaining a safe microbiological state in the host honeybee colonies by inhibiting beebread mycotic contaminations, starch, and protein predigestion in beebread by LAB is less probable. Honeybee endogenous LAB use pollen as a growth substrate and in the same time restricts fungal propagation, thus showing host beneficial action preserving larval food. This study also can have an impact on development of novel methods of pollen preservation and its processing as a food ingredient. Background: Propolis consists of a complex mixture of resinous substances collected by honeybees from different plant sources. The objective of this study was to investigate the chemical composition, biological activities, and synergistic properties with antibiotics of propolis samples collected from various geographic origins (Germany, Ireland, and Czech Republic). Methods: The chemical composition of the propolis was analyzed by Gas Liquid Chromatography-Mass Spectrometry (GLC-MS) and High-performance liquid chromatography (HPLC). The minimal inhibitory concentration (MIC) and minimal bactericidal concentration (MBC) were evaluated by the standard broth microdilution method, while synergistic interactions were assessed by checkerboard dilution and time-kill curve assays. Results: HPLC and GLC-MS analyses revealed that ethanol extract of propolis (EEP) and water extracts of propolis (WEP) contained more than 100 different phytochemicals. The most abundant compounds were aromatic alcohols, aromatic acids, cinnamic acid and its esters, fatty acids, and flavanone (chrysin). Czech propolis showed the highest phenolic content (129.83 ± 5.9 mg CAE/g) followed by Irish propolis and German propolis. Furthermore, Irish propolis exhibited the highest value of total flavonoid content (2.86 ± 0.2 mg QE/g) and antioxidant activity (IC50 = 26.45 µg/mL). All propolis samples showed moderate antibacterial effect against Gram-positive microorganisms with MIC ranging from 0.08 mg/mL to 2.5 mg/mL. Moreover, EEP exhibited moderate activity against Gram-negative bacteria with MIC between 0.6 mg/mL to 5 mg/mL. In addition, EEP displayed moderate antifungal activity (MIC values between 0.6–2.5 mg/mL). The results obtained from time kill-kinetic assay and checkerboard dilution test of two-drug combinations between EEP and antibiotics such as vancomycin, oxacillin, and levofloxacin indicate mainly synergistic interactions against drug-resistant microbial pathogens including MRSA and VRE. Conclusions: The propolis extract synergistically enhanced the efficacy of antibiotics, especially those acting on cell wall synthesis (vancomycin and oxacillin) against drug-resistant microorganisms. Australian honey makers say they will fight the granting by UK authorities of a trademark for Manuka honey to Kiwi producers. The Australian Manuka Honey Association (AMHA) said it had engaged legal representation in the United Kingdom "who has been briefed to act swiftly in refuting the attempt to trade mark 'Manuka' – honey that has been produced in Australia naturally since records have been kept in the 1800's". There’s a gold rush of sorts happening in Australia and New Zealand—liquid gold, that is. New Zealand’s manuka honey, known for its antioxidant properties as well as its steep price tag, has been one of the great superfood success stories of recent years. And as with any good melodrama, there is always a dark horse to shake things up. Enter jarrah honey. Harvested from the jarrah tree, it is rarer and more costly to produce than manuka because it comes from a species of tree endemic only to the most pristine, remote stretches of Western Australia. “It’s quite a unique honey compared to all other eucalypts,” says Dr. Rob Manning, PhD, a former researcher for Australia’s Department of Agriculture and Food who spent three decades studying Australian jarrah honey and comparing its benefits to New Zealand manuka. Once a cheap honey “prior to the discovery of its antimicrobial properties, it’s now $30 per kilogram because of the demand and limited quantities available.”..
Turkish honey producers are becoming more interested in producing the royal jelly along with honey, head of the Ordu Association of Beekeepers (ORAY-BİR) Akın Çiftçi said. The royal jelly, known in Turkish as "arı sütü" which means "bee milk," is a milky secretion produced by worker honey bees. 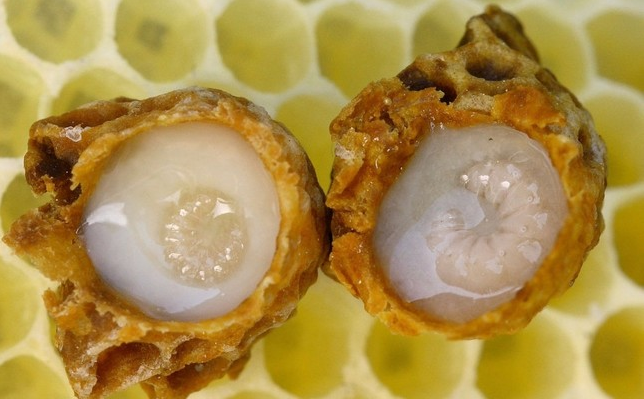 According to Çiftçi, the interest in producing the royal jelly is largely boosted by its high price despite how hard and troublesome it is to produce it. "A gram of royal jelly is sold for seven [Turkish] liras ($1.85), while a kilogram — for 7,000 liras," Çiftçi said. He also said the royal jelly has to be kept in 10-gram tubes away from direct sunlight in a fridge. "The royal jelly should definitely not see the sun. If it sees the sun, it will be spoiled and it will not have any benefits afterwards," Çiftçi added. The head of the ORAY-BİR warned that some products sold in stores as royal jelly were not actually real.